I live in Valdosta, GA, and teach journalism/English at Lowndes High School. I went to the Ukraine in the summer of 2005. I taught the high school class at Public School #10 in Dzerzhinsk for a week. Then I stayed another week to help visit the orphanages. I got to see most of the ones His Kids Too! helps. We passed out many bananas and cookies which gave me the idea of Going Bananas for Orphans. Lowndes High School raised almost $2,000 this Fall to provide seasonal fruit to as many orphanages as possible. They will collect again in March. I was certainly touched by the conditions andvchildren. I could tell you stories of walking with Oleg, a toddler badly burned, or holding hands with a malnutritioned, barely clothed teenager before we entered Torez who looked longingly at the food in the market. I have known the Fillmons for almost 20 years and taught Dallas (their son) as a kindergarten student during Sunday school. I also kept in touch with Bill Wharton and have helped send money and clothes to the Ukraine. 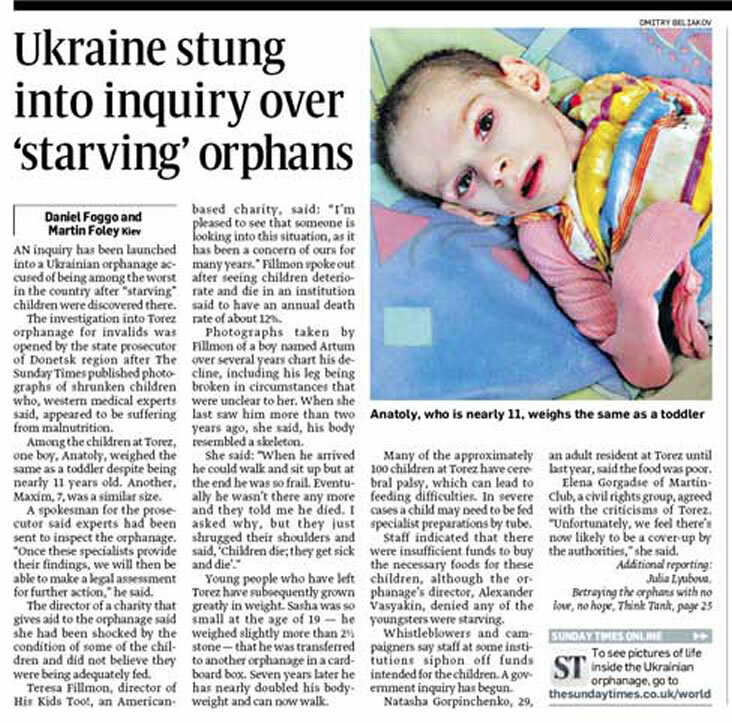 It is very faith building to see how God has provided for the orphans and the people of Ukraine. God continues to open doors and opportunities to this area. Jesus said pure and undefiled religion is helping widows and orphans. This is a wonderful opportunity to be like Jesus. You can help in so many ways. I met Teresa while sitting in the Kiev International Airport in late March 2004. I had just spent a week teaching a class in the Kiev Business School. Within five minutes, I was intrigued by her passion and her commitment to this noble cause, and I have been involved with the organization since. The following spring (2005), I initiated a shoe drive at my church, Independent Presbyterian Church (PC-USA). This effort is ongoing, and so far has resulted in several hundred pounds of shoes. We hope to provide care packets for orphans in the next few months through a similar effort, and we are bringing Teresa to speak to our congregation on April 23, 2006. Finally, a private foundation begun by church members (the IPC Foundation) granted $5000 to HKT for the coming fiscal year. I will work with Teresa to apply for additional funding in the coming year. I hope this is just the beginning of a productive relationship between HKT and our congregation. While these efforts are small, they’re a start! I am committed to this cause and to Teresa, and intend to remain involved in this ministry as long as I can help. Finally, I will say that my involvement with Teresa and this organization has served to strengthen my faith, particularly in two respects. First, I believe that we are surrounded by opportunities to exercise our faith and make a difference in the lives of others, but we must be receptive to these opportunities when they occur. Who would have thought that a casual airport conversation would begin such a meaningful experience for me?! Second, I believe our world needs more “Christian faith in action,” and I am grateful for this opportunity to exercise my faith through involvement with His Kids Too. A favorite quote of mine comes from Mahatma Gandhi – “We must become the change we want to see in the world.” I believe that Teresa Fillmon and the His Kids Too ministry illustrate this notion admirably.